The island was originally settled around 1500 BC by the Ciboney people. They were later replaced by the Arawaks and then the Caribs. Christopher Columbus sighted the island in 1493 on his second voyage to the New World. Denmark-Norway's first attempt to settle the island in 1665 failed. However, the Danes did resettle St. Thomas in 1671, under the sponsorship of the Glueckstadt Co., later the Danish West India Company. The first slave ships arrived in 1673, and St. Thomas became a slave market. The island became a Danish crown colony in 1754, and was granted free port status in 1764. The land was divided into plantations and sugarcane production became the primary economic activity. As a result, the economies of Saint Thomas and the neighboring islands of Saint John and Saint Croix became highly dependent on slave labor and the slave trade. In 1685, the Brandenburgisch-Africanische Compagnie took control of the slave trade on Saint Thomas, and for some time the largest slave auctions in the world were held there. Saint Thomas's fine natural harbor became known as "Taphus" for the drinking establishments located nearby. ("Tap Hus" translates as "rum shop" or "tap house" referring to the drinking establishments.) 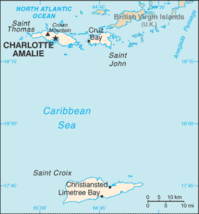 In 1691, the primary settlement there was renamed Charlotte Amalie in honor of the wife of Denmark's King Christian V. It was later declared a free port by Frederick V. In December 1732, the first two of many Moravian Brethren missionaries came from Herrnhut Saxony in present-day Germany to minister to them. Distrusted at first by the white masters, they lived among the slaves and soon won their confidence. From 1796 a small Jewish community developed in Charlotte Amalie. It established a historic synagogue, Beracha Veshalom Vegmiluth Hasidim, the oldest synagogue in continuous use anywhere in the United States or its external territories. The first British invasion and occupation of the island occurred in 1801. The islands were returned to Denmark in 1802, under the terms of the Treaty of Amiens. Fire destroyed hundreds of homes in Charlotte Amalie in 1804. The second British occupation of the island occurred from 1807-1815, after the Invasion of the Danish West Indies (1807), during which they built Fort Cowell on Hassel Island. While the sugar trade had brought prosperity to the island's free citizens, by the early 19th century Saint Thomas was in decline. The continued export of sugar was threatened by hurricanes, drought, and American competition. Following the Danish Revolution of 1848, slavery was abolished and the resulting rise in labor costs further weakened the position of Saint Thomas's sugar producers. Given its harbors and fortifications, Saint Thomas still retained a strategic importance, and thus, in the 1860s, during the American Civil War and its aftermath, the United States government considered buying the island and its neighbors from Denmark for $7.5 million. However, the proponents of the purchase failed to gain legislative support for the bid. As the islands were poorly managed by the Danes, a local islander, David Hamilton Jackson, was instrumental in persuading the Danish to allow the US to purchase the islands of Saint Thomas, Saint John, and Saint Croix. In 1915, he traveled to Denmark and convinced the King of Denmark to allow freedom of the press in the islands. He began the first newspaper in the islands, known as The Herald. After this, he organized labor unions among the islanders for better working conditions. The islands now have an annual celebration in November to honor the legacy of David Hamilton Jackson. 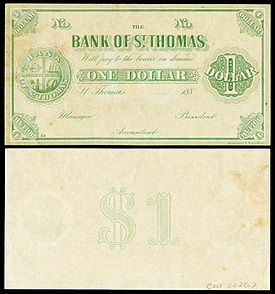 In 1917, Saint Thomas was purchased (along with Saint John and Saint Croix) by the United States for $25 million in gold ($489 million today), as part of a defensive strategy to maintain control over the Caribbean and the Panama Canal during the First World War. The transfer occurred on March 31, 1917, behind Fort Christian before the barracks that now house the Legislature of the U.S Virgin Islands. The baccalaureate service for the transfer was held at the St. Thomas Reformed Church as it was identified as the American church in the Danish West Indies. The United States granted citizenship to the residents in 1927. The U.S. Department of the Interior took over administrative duties in 1931. American forces were based on the island during the Second World War. 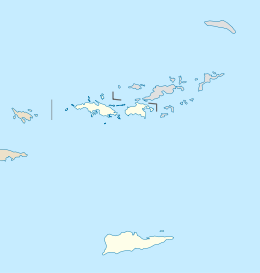 In 1954, passage of the U.S. Virgin Islands Organic Act officially granted territorial status to the three islands, and allowed for the formation of a local senate with politics dominated by the American Republican and Democratic parties. Full home rule was achieved in 1970. The post-war era also saw the rise of tourism on the island. With relatively cheap air travel and the American embargo on Cuba, the numbers of visitors greatly increased. Despite natural disasters such as Hurricane Hugo (1989) and Hurricanes Luis and Marilyn (1995), the island's infrastructure continues to improve as the flow of visitors continues. Hotels have been built from the West End to the East End. The island has a number of natural bays and harbors including Magens Bay, Great Bay, Jersey Bay, Long Bay, Fortuna Bay, and Hendrik Bay. Passenger ships dock and anchor in Long Bay, near Charlotte Amalie. Ships dock at Havensight Pier. The island is serviced by the Cyril E. King International Airport. Passenger and limited car-ferry services to neighboring islands such as Water Island, Saint John, Saint Croix, and the British Virgin Islands run regularly out of the Red Hook Terminal, Charlotte Amalie, and Crown Bay Marina. The United States Virgin Islands is the only place under United States jurisdiction where the rule of the road is to drive on the left. This was inherited from what was the then-current Danish practice at the time of the American acquisition in 1917. However, because Saint Thomas is a U.S. territory, most cars are imported from the mainland United States and therefore the steering column is located on the left side of the vehicle. The island has many regular taxis from compact size to large vans, as well as open-air, covered trucks called "safaris" with bench seats. The latter usually operate only between high-traffic points, e.g., cruise-ship terminals at Havensight and Crown Bay and downtown Charlotte Amalie. St. Thomas-St. John School District operates public schools on Saint Thomas. Emile Griffith − former boxer who won world championships in both the Welterweight and Middleweight divisions. Karrine Steffans − former hip-hop music video performer and actress and the author of Confessions of A Video Vixen. David Levy Yulee − an American politician and the first member of the United States Senate to have been, at one time, a practicing Jew. Blackbeard's Castle in Charlotte Amalie. Magens Bay as seen from Drake's Seat, St. Thomas, USVI. ^ "Where is the U.S. Virgin Islands: Geography". vinow.com. Retrieved April 8, 2017. ^ Kossler, Bill (August 24, 2011). "USVI Population Down Since 2000". stthomassource.com. V.I. Source Publications. Retrieved January 11, 2017. ^ This is the figure given on page 1 of the United States Geological Survey's Open-File Report 72-201. It is also the figure given in the article at the on-line edition of the Encyclopedia Britannica. The Virgin Islands (United States) page at the United Nations Environmental Programme's Island Directory gives a substantially lower figure, reporting the area as 69.7 square kilometers, equivalent to 26.9 square miles. And although the U.S. Census Bureau does not report the areas of geographic entities, it does report their population densities (equal to the total population divided by the area). In the 2010 census, the population was reported as 51,634 (Table P1, "Total Population") and the population density was reported as 1,649.1 per square mile (Table P40, "Population Density"). Together, these figures imply an area of 31.3 square miles. ^ a b U.S. Virgin Islands: a guide to national parklands in the United States Virgin Islands. Washington, D.C.: Division of Publications, National Park Service, U.S. Dept. of the Interior. pp. 24–25, 37–39. ISBN 0912627689. ^ "Charlotte Amalie St. Thomas U.S. Virgin Islands". guidetocaribbeanvacations.com. ^ Hamilton, J. Taylor and Hamilton, Kenneth G., History of the Moravian Church, Bethlehem, PA, 1969. ^ "David Hamilton Jackson - Famous Virgin Islander". here.vi. ^ Liberty Day festivities to include parade, re-enactment about D. Hamilton Jackson, The Virgin Islands Daily News. ^ "United States Virgin Islands Department of Tourism site". Visitusvi.com. Retrieved December 17, 2011. ^ "NOWData - NOAA Online Weather Data". National Oceanic and Atmospheric Administration. Retrieved January 19, 2013. Wikimedia Commons has media related to Saint Thomas, United States Virgin Islands. Wikivoyage has a travel guide for Saint Thomas.